The Liberal Democrats have been the only party not to get dragged into silly debates about immigration numbers. It’s very easy to be critical of the Liberal Democrats these days; many argue that Cameron and Osborne have run roughshod over them, with the party being nothing but a sanctimonious footman to the aristocratic, welfare-slashing Conservatives. The removal of the £3290 cap on tuition fees, even four years after the event, is likely to represent an albatross around their necks at the next general election. Even in the upcoming European elections the party is struggling for an identity, with senior party members privately worried that the poll on May 22 could see them wiped out in Brussels. 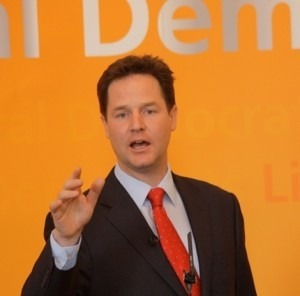 Clegg has therefore opted for a rather risky ploy – in the sense that it runs counter to the public mood – by choosing to present the Liberal Democrats as the ‘in’ party in Europe. “I’ll tell you what I’ll do. I will challenge Nigel Farage to a public, open debate about whether we should be in or out of the European Union. “He is the leader of the party of out; I am the leader of the party of in. Such a choice may prove inspired. The possibility of prospective UKIP voters switching to the Lib Dems is already less than remote, Labour are afraid to go near the issue, and the Conservatives, by promising a referendum on the EU, are essentially trying to get the country to decide what the party is too weak to decide itself. The Liberal Democrats, on the other hand, have been the only party not to get dragged into silly debates about immigration numbers, continuing to stress the benefits membership of the European community offers Britain. Clegg noted yesterday that three million jobs are directly reliant on Britain being a member of the EU. This positive stance is likely to attract votes from those disillusioned by the inescapably negative coverage of immigration and Europe from the other three parties. It also ties the party to its historical roots – among the key tenets of classical liberalism was its promotion of the free movement of goods, services, people and capital (three out of four of which, incidentally, UKIP also endorse). Stepping away from the narrow narrative of party-politics, Clegg can also claim this his party is the only one not threatening the country’s future by reducing immigration to the extent that Britain’s ageing population will be increasingly dependent on a diminishing working-age labour pool – inevitably resulting in smaller pensions, higher taxes, or more borrowing than would otherwise be the case. Every complaint trotted out noting that hospitals and schools are becoming overcrowded forgets (or, more likely, ignores) that immigrants have made a net contribution of £25bn to the UK economy since 2000, with EU immigrants paying 34 per cent more in taxes than so-called “native-born British people” (as though judging someone on where they’re born is any less unfair than on their skin colour or gender). Nick Clegg’s principled and unashamedly pro-EU stance deserves applauding. It’s a depressing reflection of British society that we’re attacking the right of our fellow Europeans to earn a living rather than concentrating on Britain’s rank inequality – that we’re prioritising one biscuit over the other eleven. What is to be applauded about being “unashamedly pro-EU”? The sooner the whole rotten structure collapses the better. I don’t say this as an anti-European little Englander – I want all the people of Europe to be liberated from it’s corrupt/elitist/monetarist shackles!